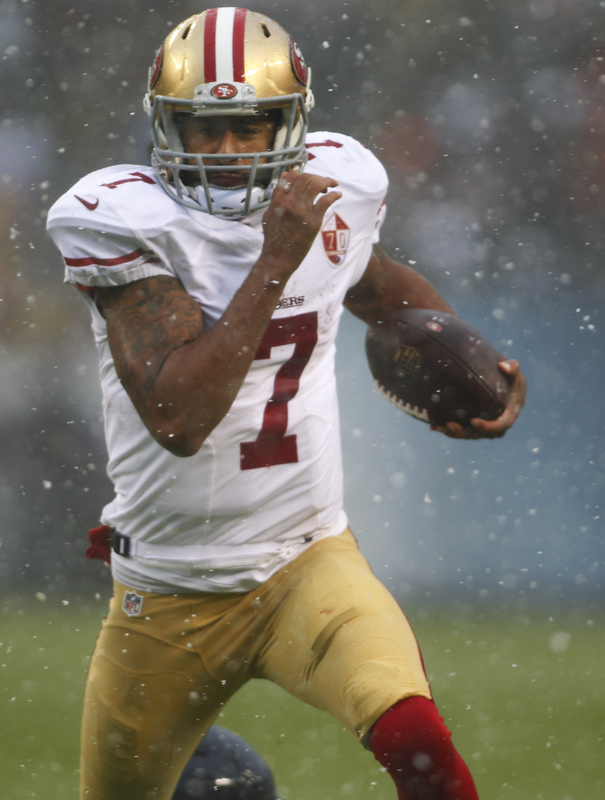 When the Jaguars opened up their quarterback competition in August (only to close it again one week later), there was some speculation that Jacksonville could look into signing free agent quarterback Colin Kaepernick. That speculation was fueled in part by club owner Shad Khan, who said that he would “absolutely” be okay with his team signing Kaepernick if his football people recommended him. That never happened, and when Blake Bortles was named the starting quarterback last week, the Kaepernick-to-Jacksonville chatter, such as it was, died down. But unless Bortles flashes some hitherto unsuspected ability, the Jaguars will still have a glaring need at the quarterback position. Indeed, the club has enough talent that it could conceivably make a playoff push in a shaky AFC South if it can get consistent QB play, and some believe that Kaepernick would represent enough of an upgrade to get the Jags back to the postseason. However, executive vice president of football operations Tom Coughlin has emphatically quashed the Kaepernick discussion. When asked if he ever considered Kaepernick, Coughlin said, “No, I didn’t. We did the study and the research and we weren’t interested.” When asked for his reasoning, Coughlin said, “No, I’m not explaining it. I just said what it is” (Twitter link via Ryan O’Halloran of the Florida Times-Union). Of course, this will be construed in some segments as an unenlightened decision to decline adding a player that might improve the club because that player took advantage of his freedom of expression and alienated a large portion of the NFL’s fanbase in the process. And maybe that segment would be right. But Coughlin is an intelligent football man, and as Kaepernick is a system quarterback whose salary demands and current commitment to football are largely unknown, it is fair to think that Coughlin’s decision was football-driven. Whether its Bortles, Kap, or another QB, it won’t matter who plays QB for Jacksonville until the offensive line gets upgraded/starts playing better. Next to QB, the O-line has arguably been the worst position for the Jags the past 4 years. For whatever reason, the front office doesn’t see that. For all the cap room the Jags have had the past three offseasons, the best the Jags did to even upgrade it in free agency was add a backup lineman. Way too many resources were spent on upgrading the defensive side of the ball when the offense is the bigger issue. A good investment: buy Kaep for what he is worth and sell him for what he thinks he is worth!!! If he truly wants to play….take the league minimum and earn the rest based on performance!!! He is living off the big $ from niners….he expects another big payday…the only one he gets is a candy bar! He is not an accurate passer and the tape shows that. QBs who run get killed. The pistol went to Canton! Look on the bright side Colin, it frees up all your time to run your big mouth. “character matters”. How dare someone take a stand for the way others are treated! GD you Kap, GD you. I have every right to call my boss a douchenozzle and he has every right to fire me for it. Who wants a piece of that circus? Even teams that don’t need him or sign players better than him are getting worked over by social justice warriors. Why open that door? Totally not worth it. I would rather sign a quarterback from a youth or high school football team than sign this scum! Tom Coughlin is a no-nonsense kind of guy. There is no way that he would want to deal with the circus that comes with Kaepernick. Coughlin has always demanded that the focus be on football. That isn’t the case with Kaepernick.